SOL is an architecture designed by Burning Man for Burning Man as a celebration of its surrounding landscape.The design creates an enclosed space, which is flooded with light daily at 12pm for a limited time. This ritual occurs only when both sun and architecture line up, becoming one entity. SOL is 9m long, 3m wide and 5m tall. The entire structure is made out of 18mm birch plywood, cut with CNC and assembled on the Playa. SOL is directly connected with its surrounding landscape, mimicking the silhouette of the harsh mountains. A series of 9 chimneys, which rise from the ground create several sloped surfaces where users can lay down to relax and embrace the natural surrounding. During daytime SOL will be a climbable structure, which can also provide shelter from the challenging conditions of the desert. SOL was designed to act, appear and generate different experiences based on the user’s position. Frontally viewed it acts as a sun clock aligning with the sun at 12pm. The overall shape resembles a series of monolithic rocks emerging from the playa, which are inspired by the landscape. 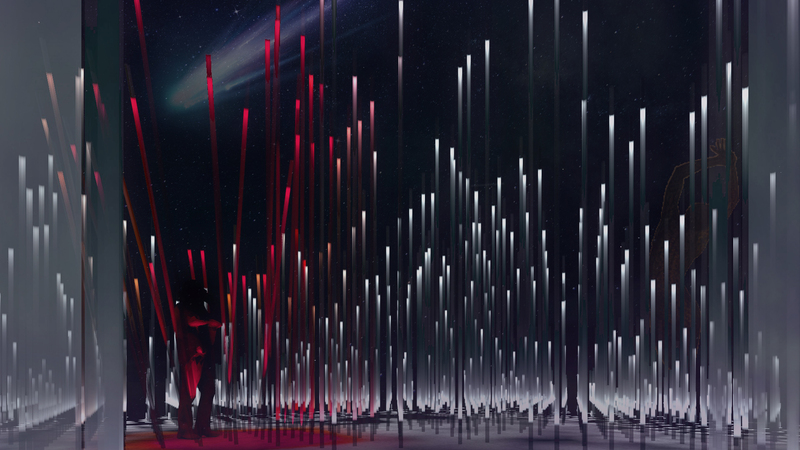 During night time, SOL is dynamically lit by LED strips both internally and externally, producing a colorful light show, which celebrates the darkness of the night through artificial light. Over the years, Black Rock City has seen a multitude of projects which have been created to animate the Playa. SOL aims to be a playful, interactive and informative design, which enhances the relationship between humans and celestial bodies, in particular with the sun. Human history has been driven by the cult of the sun, and divinities and architecture have been dedicated to it. With the help of parametric design and environmental analysis, SOL is a direct representation of a particular moment on the playa: 12pm of everyday. Internally, the light that penetrates and cast itself on the floor for only 30 minutes, wants to make the user aware of the sun’s movement in a more evident way. This phenomenon is a daily ritual, which brings people together in order to experience a connection with our universe that we sometimes take for granted since we cannot directly perceive it. The wooden structure will be lit on fire on the last day of the festival since it was designed to exist only at Burning Man for the length of the festival. My inspirations has a direct link to archeoastrology, a science that looks at the relationship between celestial bodies and architecture, i.e. Stonehenge, Chiceniza and the Parthenon in Rome. The common element between these projects is the attention, precision and relation with the sky and the movement of the sun. All of these projects and many more, create a different dimension where the architecture only becomes a tool to admire and contemplate what surrounds us. In conclusion, SOL aims to be an example of how architecture can be shaped by the use of datas and parametric design, in order to deliver a project which is directly derived from its surrounding environment.